Revisiting on old favorite on a brand new Arrow Films Blu-ray box set. From The Old Dark House, let’s move on to just plain old House, the horror comedy that mingles PTSD and George Wendt. 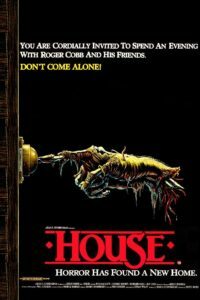 While we’re on the topic of house-based horror movies, I wonder if you could fulfill and entire Hooptober Challenge list with only movies containing “House” in the title. 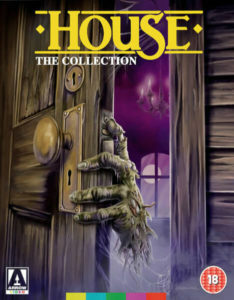 Hausu, House of Sorority Row, Last House on the Left, House of Wax, , House II, House 3, House 4, Road House, Animal House, etc. Old English hus “dwelling, shelter, building designed to be used as a residence,” from Proto-Germanic *husan (source also of Old Norse, Old Frisian hus, Dutch huis, German Haus), of unknown origin, perhaps connected to the root of hide (v.) [OED]. In Gothic only in gudhus “temple,” literally “god-house;” the usual word for “house” in Gothic being according to OED razn. It’s no surprise that the Germans had a hand in this. But what would the Greatest American Hero know about Germanic word origins? Troubled author Roger Cobb (William Katt) misplaced his son and as a result of his separation from his wife, moved into the family house in which his aunt committed suicide. He’s determined to finish the book about his time in Vietnam, but unsettling nightmares about his time in the war and his potentially sociopathic commanding officer (Richard Moll) deter progress. Soon the house itself attempts to expunge its new inhabitant. Cobb attempts to convey suspicions about the house to his next door neighbor Harold (George Wendt). Instead of assisting, Harold begins a peeping-tom suicide watch. House remains an oddity in the horror genre — a goofy, schlocky horror film that simultaneously entertains a rather serious conversation about post-traumatic stress disorder. 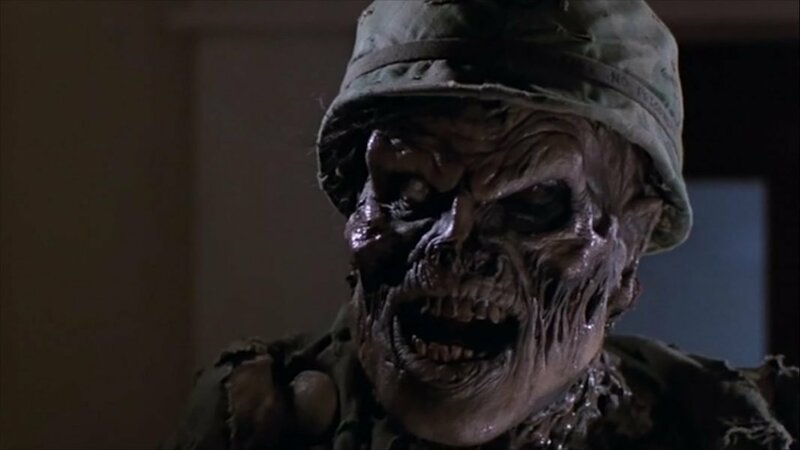 If you remove the creature effects (that owe a deep debt to Evil Dead and perhaps in turn influenced how Sam Raimi approached Evil Dead 2) and the light-hearted interaction between Cobb and Harold, House becomes a psychological thriller about the Vietnam War. You have to peel back a few layers, but it’s there — even though the film’s limited budget (and William Katt’s hair) undermines the gravitas of the war-era flashbacks. So what is House exactly? 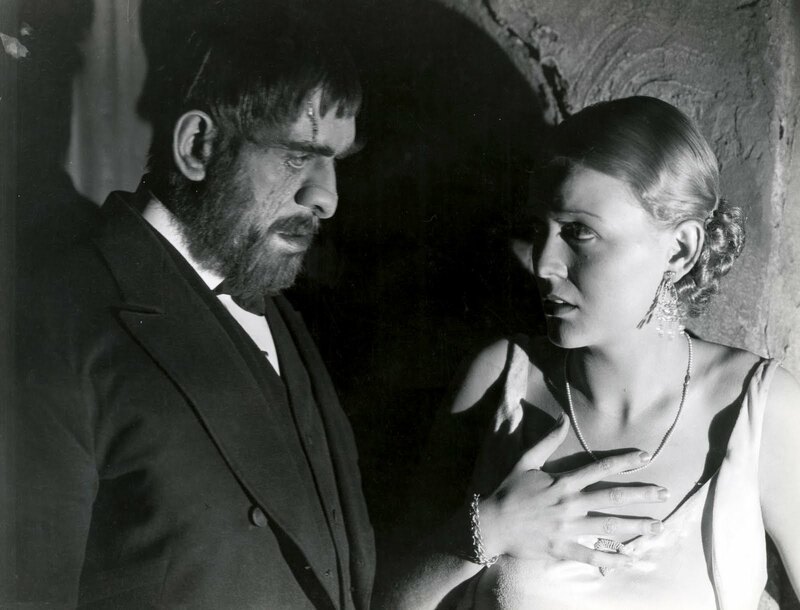 Without more space and a greater study of the film’s specific eccentricities, we’ll call it a kitchen sink horror film of ideas and inspirations that works more often than it doesn’t even though it shouldn’t. Follow? With that in mind, House‘s lasting value remains the “things” that go bump in the night. 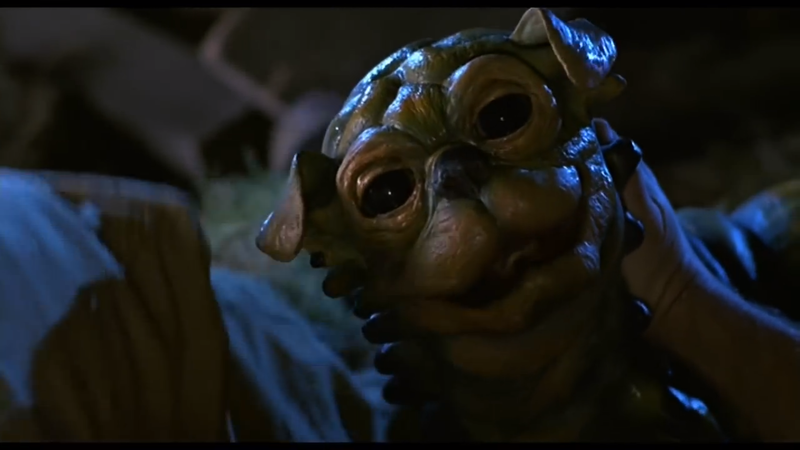 Backwood Films designed and fabricated seven different creature models for the film. 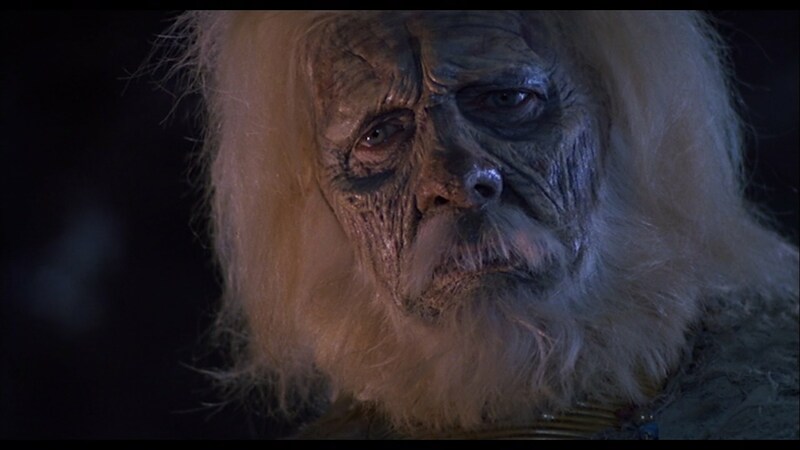 The obese witch that Cobb chops to bits and Richard Moll’s rotting corpse of a solider leave lasting impressions but it’s the closet-bound “war demon” that deserves a special shout out. The elaborate, fully-mechanical puppet required fifteen operators/handlers. Modern CGI would have rendered this in a weekend. And it would have been dull and forgettable. Take a moment to cherish these efforts. Credit where credit is due. House’s “war demon” puppet is a work of art. Directed by Steve Miner (Friday the 13th Part 2, Part 3) and produced by Sean S. Cunningham, the creator of Friday the 13th and director of Part 1, House boasts a curious pedigree and one of which I wasn’t even aware until this rewatch. House manages are few moments of legitimate suspense as Cobb dares to discover what might lie behind Door #3. Still effective, still funny, House’s scattershot brand of horror succeeds because it embraces the audience experience. 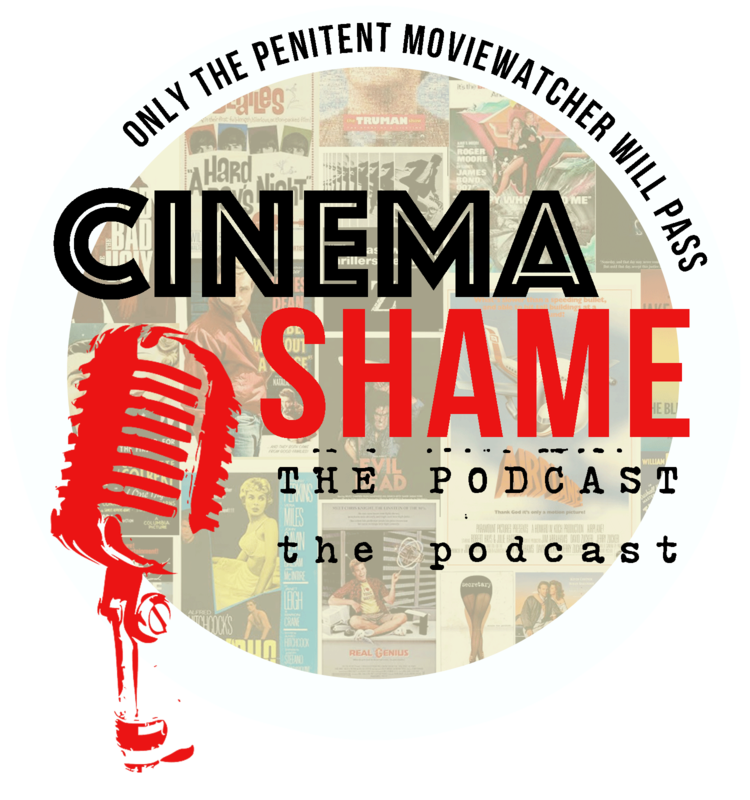 A little bit of horror, a little bit of humor, and a little bit of something to ground the film in real world trauma. It won’t hold up under the critical eye of someone looking for flaws, but that’s not our concern. 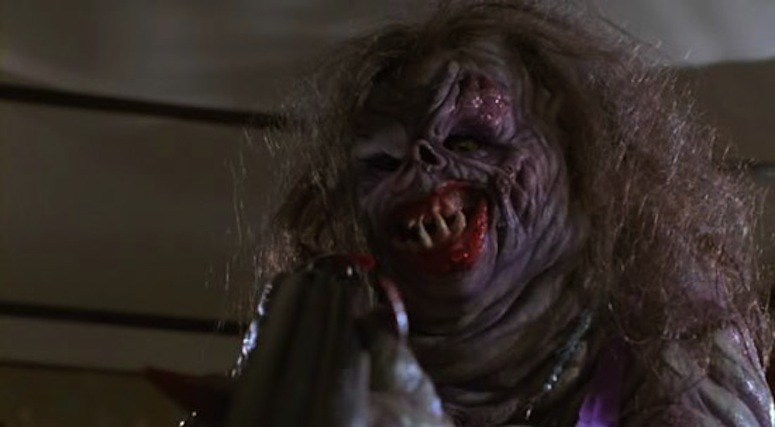 Don’t we all just want to have some fun with our 80’s haunted house flicks? 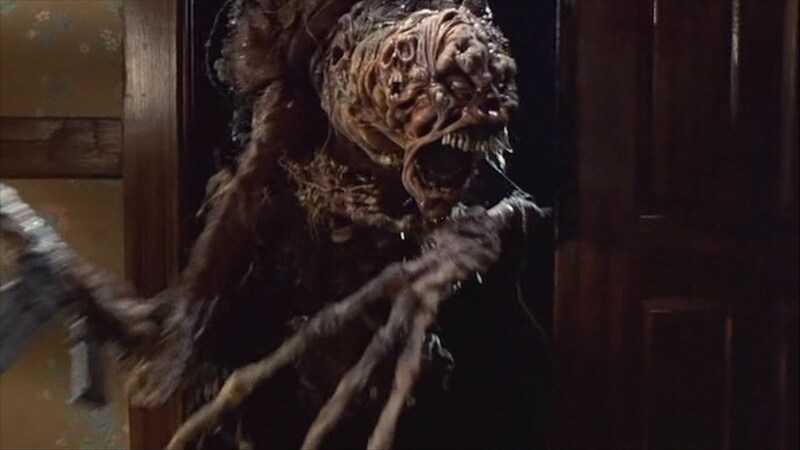 House is probably a three-star film, but I hold a special place in my heart for movies that dare to give me a Victorian mansion filled with oozy, drippy, practical-effects creatures from another dimension. First of all, love the punnage, House II. Bravo. Miner and Cunningham abandoned House. Ethan Wiley and Fred Dekker snapped it up. If you’re a horror fan, there’s a good a chance you were familiar with the names Miner and Cunningham; I doubt, however, that Wiley and Dekker ring many immediate bells. You’re excused. Fred Dekker actually had a nice little career in the offing at this point in 1986. 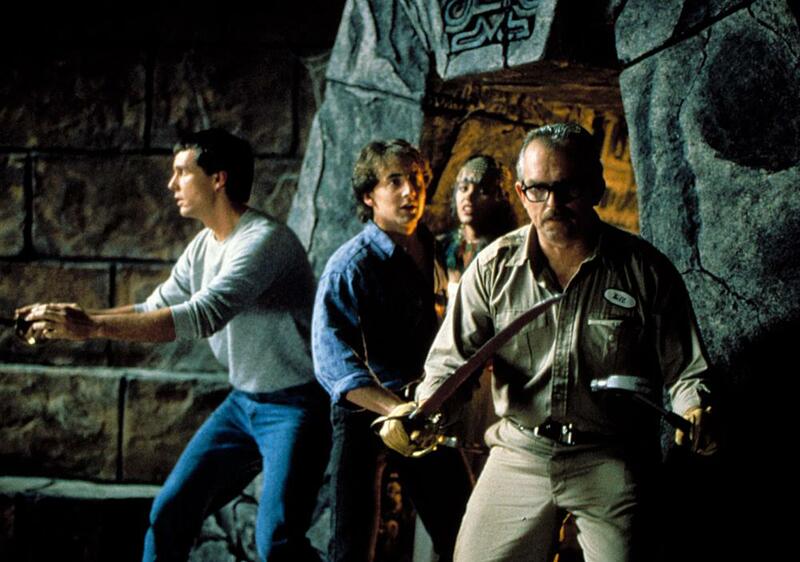 He’d had hand in the screenplay for House (1985) and wrote and directed the fantastic Night of the Creeps (1986). He added The Monster Squad (1987) to his resume a year later. His films tended to earn a nice critical reception, but flop at the box office. I’ll tell you, but you won’t believe me. Jesse (Soul Man‘s Arye Gross) and his girlfriend Kate (Lar Park Lincoln — real name!) move into an old mansion that had been in his family for generations. His parents were murdered there; you know how that whole childhood nostalgia thing goes. As a kind of housewarming party, Jesse’s friend Charlie arrives with his wife Amy Yasbeck for a sleepover. Jesse finds a picture with his great-great grandfather holding a crystal skull thing and he decides for some reason that the skull must be buried with him. So they dig him up. After “Gramps” returns to life and tries to kill them, they all become buddies. Just two crazy friends and their redneck cowboy. Why this never made the leap to TV sitcom, I’ll never understand. The boys drink and carouse and tell stories and Gramps explains that the family house was actually built with Aztec stones that somehow, with the help of the skull, certain rooms create a portal across space and time. Gramps then makes Jesse and Charlie promise to protect the skull from the forces of evil that would try to steal it. So here’s your inciting incident. I’ll just lay it out plainly so not to confuse anyone. At an impromptu Halloween party, a barbarian guy steals the skull, which is just hanging out on a pedestal at the party, while Jesse fends off a drunk ex-girlfriend, meets a baby pterodactyl and a worm-dog thing, and his current girlfriend runs off with Bill Maher in a jealous rage over the ex’s party presence. Obviously the guys keep the pterodactyl and the worm-dog thing as pets. Obvious. No concern over the cross-dimension consequences. This ushers in the film’s most inspired sequence where Bill (John Ratzenberger) arrives to inspect the old house’s wiring and introduces himself (with business cards!) as an “electrician / part-time adventurer” and proceeds to lead Jesse and Charlie through the inter-dimensional portal to retrieve the skull and rescue a would-be virgin sacrifice. I cannot stress this enough. John Ratzenberger as a time-traveling spacetime adventurer should have been a 12-movie franchise. 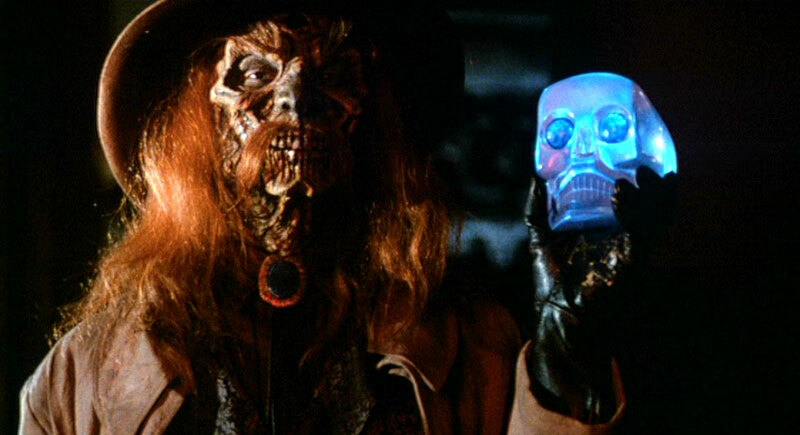 And yada yada yada, they get the skull back and Jesse fights an undead gunslinger named Slim Reeser and saves the day. This movie doesn’t give two $&^#s about anything, and I can admire that about a movie. Two guys got drunk on tequila and wrote this thing on expired Bed, Bath & Beyond coupons. Don’t settle for the stateside offering of merely House and House II when you can have all four House films by ordering Arrow Films’ House: The Collection. On the other hand it’s a bit rare now, so you should probably just go ahead and order the US edition, House/House II: Two Stories. And upon further review, it appears that that is also rather hard to get. So. 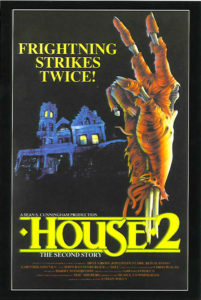 Here’s the newly available House and House II single movie editions. 31+ Days of Horror. 33 Horror Movies. 33 Reviews.